(MoneyWatch) According to a recent survey by travel site TripAdvisor, nearly half of Americans plan to travel for the December holidays. Forty-five percent of those surveyed said they would travel for Christmas, Hanukkah or New Years, up from 42 percent from 2011. 5. San Francisco. 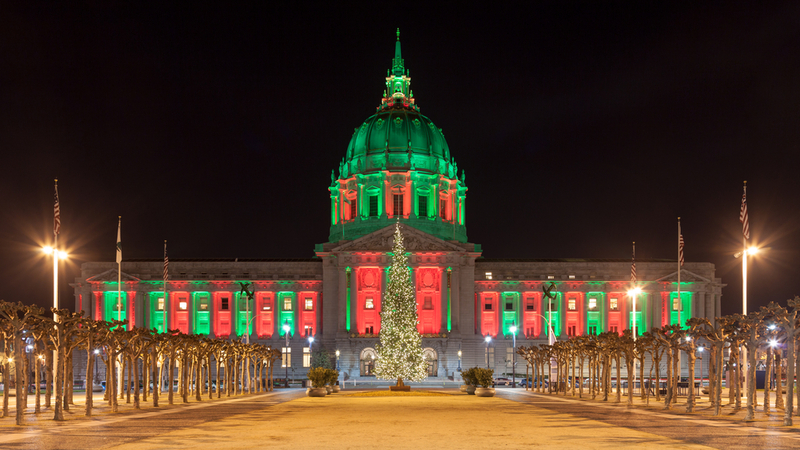 You won't have a white Christmas, but you'll certainly have a great time if you spend your holidays in San Francisco. Check out the Christmas tree in Union Square, then rent a pair of skates and take a few laps on the ice rink next door. For a holiday treat, head to Fisherman's Wharf and check out the holiday lights that adorn the fishing boats. The combination of gorgeous lights and shimmering water is a great way to get in the holiday spirit. 4. Los Angeles. Like everything else in L.A., holiday celebrations tend to be on the glitzy side. There's plenty to do for both adults and kids, from Disneyland's famed Christmas parade to ice skating in downtown L.A. Try to spot celebrities at the Hollywood Christmas parade -- the three-mile route follows both Hollywood and Sunset Boulevards -- then get your shopping done on Montana Avenue's holiday walk. 3. Chicago. America's "second city" is a first-class destination for the holidays. Browse for gifts in the open air Christkindlmarket in Daley Plaza, a Chicago tradition since 1996, then head to the famous Walnut Room at Macy's for a bite to eat. A tradition since 1907, this landmark restaurant serves up plenty of holiday cheer to locals and tourists alike. Finish up a perfect night with a trip to ZooLights at Lincoln Park Zoo to see animals, ice carvers and thousands of twinkling lights. 2. Boston. It's not hard to get in the holiday spirit in Boston. Start with a visit to the city's official Christmas tree on Boston Common. The tree is donated every year by the Canadian province of Nova Scotia, and fireworks usually accompany the lighting ceremony. Do some caroling at the famous Trinity Church, or visit the Harvard Square holiday craft fair and pick up some gifts for friends and family. 1. New York. There's no other city that celebrates the holiday season quite like New York. From the iconic Macy's windows to the spunky Rockettes, there are plenty of traditions to enjoy. Head to Rockefeller Center to see the enormous Christmas tree and then do a little skating on the center's ice rink. Enjoy the New York Transit Museum's holiday train show, located inside Grand Central terminal, or take public transit to Brooklyn and see the famous holiday lights in the Dyker Heights neighborhood.